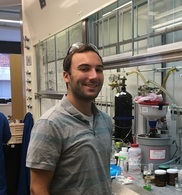 Aaron Beeler received his Ph.D. in 2002 from Professor John Rimoldi’s laboratory in the Department of Medicinal Chemistry at the University of Mississippi. He then joined the Porco group as a postodoctoral fellow and subsequently the Center for Chemical Methodology and Library Development at Boston University, now the Center for Molecular Discovery. He was promoted to Assistant Director of the CMLD-BU in January 2005. In 2012 Aaron joined the Department of Chemistry as a tenure-track professor in medicinal chemistry. Aaron teaches sophomore Organic Chemistry CH204, Organic Reaction Mechanisms CH642, and Medicinal Chemistry CH644.